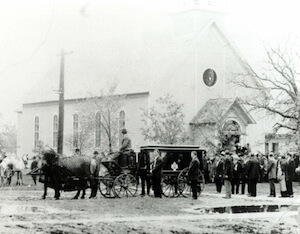 Our family has been involved in funeral service since 1900 when John Dingmann began providing services in Clear Lake, Minnesota. In 1936 Francis E. Dingmann returned to follow in his father's footsteps and eventually expand to Kimball. F.E. 'S son, Art, took up the torch as owner and funeral director of Dingmann Funeral Care from 1976-2014. Today, in Annandale, Kimball and Maple Lake, Art's son, Brian, and Brian’s wife, Dana, proudly carry on the family tradition of providing quality service and care to families in central Minnesota. In attempting to keep up with the many ongoing changes and our concern with the education and welfare of the public and our employees, we are current members of the Minnesota Funeral Directors Association, National Funeral Directors Association and Selected Independent Funeral Directors; we are also active with Children's Grief Connection. It is our desire to share that knowledge with care and compassion and to respond to your trust, with assurance that your wishes are carried out with humility, dignity, and respect. We at Dingmann Funeral Care understand and care about the grief you are experiencing. We have the specialized ability to assist you during one of life’s most difficult times – the loss of a loved one. Our staff is trained to assist with planning funeral services that will be meaningful to all, whatever the needs or wishes may be. You are invited to rely on the four generations of experience in funeral service to help you. We pledge our complete service to you 24-hours-a-day, 7-days-a-week.